As Emergency Physicians, we are placed in the unique position of potentially identifying and treating children that have been victims of physical abuse. It is incredibly important for us to become savvy in recognizing suspicious patterns of injuries. Failure to do so and involve child protective services may mean further injury, if not death, of the child. Below is an overview of injuries that should cause you to consider abuse in your differential when you see them in the department. This results from shearing and/or tensile forces, such as by violent shaking of the child. These fractures are often referred to as bucket handle or corner fractures and are highly specific for abuse in children under age one. Spiral fractures simply mean that the mechanism of injury is that of a torsional (twisting) force and do not necessarily indicate abuse. Long bone fractures in general have a low specificity for abuse with the exception of pre-ambulatory children: a femur fracture in an infant is very suspicious for abuse. Rib fractures, especially posterior and lateral, are near pathognmonic for abuse. 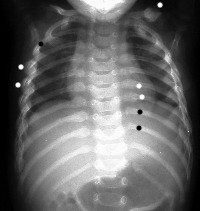 Note the calloused rib fractures (white dots) compared to the normal ribs (black dots). 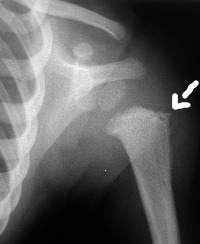 Also note the calloused left clavicle fracture. In young children, accidental causes of rib fractures are very uncommon which thus makes them highly specific for abuse, especially if posterior or lateral. These fractures are usually occult and often missed in the acute stages. They are much easier to see on x-ray when healing, after 1-2 weeks. As an aside, the current consensus in the medical literature in regards to CPR causing rib fractures is that these are exceeding rare; thus, be wary of a history that attributes rib fractures as a result of attempts to resuscitate the child. While most are probably not abuse related, taking a thorough history is most important here and afterwards comparing your exam and radiological/lab findings to see if they fit as no pattern is diagnostic. Types of skull fractures more likely to be caused by abuse include those that are bilateral, depressed, multiple or complex (crossing suture lines, more than one fracture line) or have an associated head injury. This is a broad topic and the challenge here is to consider the mechanism of injury and ask whether or not this could have happened accidentally. For example, a splash injury is more likely to be accidental while lines with clear demarcations are suspicious for abuse. Burning both hands and/or both feet is suspicious as compared to burning just one and immersion scald injuries have a pattern of injury such as flexion sparing and sparing of the buttocks which is in contact with the cooler tub/sink surface. Be aware that you can use your law enforcement in that they can go to the location of the incident and measure the water temperature as well as how long it takes to reach max temperature. Using any of the multiple charts within medical literature that demonstrates how rapidly a burn injury occurs at a child’s skin, you can determine if truly “only a second exposure to the bath water” would have caused the resulting burn injury. Bruises suspicious for abuse include the following: bruises in a child not yet cruising, brusies away from bony prominences such as forearms or shins, bruises on the ears/face/abdomen/back/buttocks/hands, multiple bruises in clusters, and of course bruises that have the shape of an object. Remember that areas over boney prominences bruise easily accidentally where as areas over padded surfaces do not. Shearing forces are required to tear the bridging veins which can be accomplished by shaking alone. Look for retinal hemorrhages and skeletal trauma in these patients. These cases can be misdiagnosed in infants who present with nonspecific signs such as letharagy, vomiting, loss of appetite, or inconsolability. If you have a suspicion for abuse, remember to perform a complete evaluation. Additional evaluation includes a skeletal survey, head CT/MRI, ophthalmologic exam for retinal hemorrhages (for suspected head trauma), and occult abdominal trauma screen (LFTs, amylase/lipase). Try to get pertinent and complete historical features (who watches the child, weapons in the home, history of abusive behavior in the home, etc). It is important to be familiar with your state’s law regarding abuse. All states require you to report suspicions of abuse and protect you legally from being sued for making such a report. As emergency physicians, we could potentially save a child’s life by considering abuse in our differential diagnosis. 2. CHAMP training at Maryland with Dr.Howard Dubowitz. This is a program that trains maryland physicians who work in CAC centers about how to do physical examinations on children suspected to suffer physical/sexual abuse and/ or neglect, orders tests, interpret results etc. 4. Lowen, D and Reece, R. Visual Diagnosis of Child Abuse. 3rd edition. AAP,2008.